This picture has been special to me ever since I took it. My dad was very resistant to doing any of the activities organized for the patients in his nursing home. He never did care much for anyone telling him he needed to do something. So I was very surprised the day I took this picture. We had been sitting in the atrium visiting when the activity director he couldn’t stand began to gather some patients for a drumming circle. I could tell Dad was curious about what they were doing; so as I was getting ready to leave I asked him if he wanted me to take him back to his room or if he wanted to stay there. 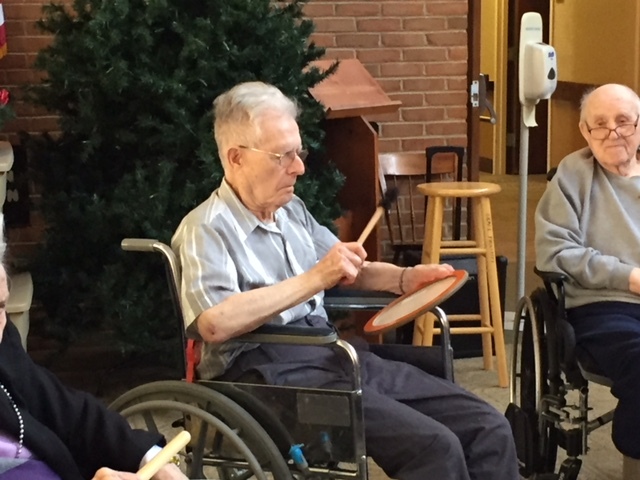 He surprised me by saying he wanted to stay and even more so when he agreed to join the group, took a tambourine and drumstick and began tapping out a rhythm. I didn’t know then that it would be the last time I would see him alive. He died two weeks later on February 12 of this year, and that final photo became priceless. I came across it while scrolling through the photo roll on my phone today and realized with a start that it has been 6 months this week since he died. The months have flown by, but every once in a while I stop and think, “I need to go visit Dad.” Those difficult visits as he was failing physically and mentally were often very challenging, but even so there’s an empty place in my life that he filled for over 70 years. That last photo seems so right in retrospect. Music was my dad’s life for 80 years. He played his tenor sax until he was 90 and sang in several choirs and ensembles at the retirement community he lived in. He had his own dance band when he was a young man playing all the Big Band standards of the ‘40’s and ‘50’s. He was in a church choir for as long as I can remember and had his own group called the Harsh Notes at the Otterbein retirement community. When he was no longer physically able to sing or play his sax a few years ago most of his reason for living was gone. For my last image of him to be making music and to be doing so in a drumming circle is also special to me for one more reason. I know my dad was disappointed that none of his children inherited his passion for making music or his musical talent. Because I can’t carry a tune in a bucket when it came time for me to join our school band in junior high our band director suggested I could play the drums. My band career only lasted a year, but I enjoyed the drums and have a warm spot in my heart that my last earthly glimpse of my dad was of him drumming. Life changes and ends, but the beat goes on.